becomes Country Music's greatest storyteller. Once upon a time, nearly eight decades ago, a little boy was born. His name was William Anderson III, but he preferred to be called Bill. Now there are a lot of Bill Andersons in this world, just look in any phone book. However, none are quite like this one. For this little boy grew to become a legend and legends always have good stories that go along with them. Some stories are based on fiction, nonetheless this one is told by the source. For this story is told by a storyteller. A storyteller who started as one of Country Music's greatest fans, who grew to become one of Country Music's greatest storytellers. The world was dark and God made stars, to brighten up the night. Did the God who put those stars above, make those city lights? Did He make a place for men to cry, when things don't turn out right? Are we just supposed to run and hide behind those city lights? 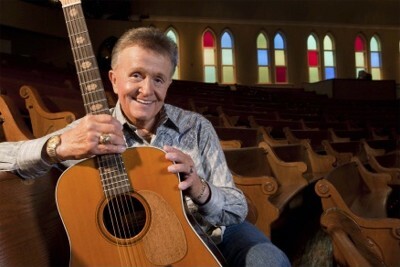 In the last seven decades, Whisperin' Bill Anderson has written, recorded and had other entertainers record his works to create at least one Top 40 Hit in each decade. Including such classics as "Saginaw, Michigan" (Lefty Frizzell), "Once A Day" (Connie Smith) and "I May Never Go To Heaven" (Conway Twitty). Today's classics include "Whiskey Lullaby" (Alison Krauss & Brad Paisley) and "Give It Away" (George Strait). This is a feat, that no other songwriter has ever done before. Mr. Anderson decided to share this accomplishment in the only way that he knew how - by writing his story. On September 1, 2016, his book Whisperin' Bill Anderson - An Unprecedented Life In Country Music History will be released to the public. Much like his composed songs, this autobiography is both poetic and elegant as well as entertaining. "I think basically the fact that I've had that, what I kind of referred to as a second career. My second career, particularly in the writing end of it." shares Bill about releasing his new book. "I felt like maybe there were a couple of things that maybe people could take out of it and one would be like... the great ole' baseball expression Yogi Berra said one time. He said 'it ain't over 'til it's over.' I thought mistakenly that... the end of about '89 or '90 when I wrote the first book - I thought well, this is it. This is over, so I might as well write it all down! Then doggone if I didn't have a whole second career that I didn't see comin'! I thought, maybe some people will take some inspiration from that...Well hey, I'm not givin' up before the final curtain comes down!" In the fall of his career, Bill was about to hang up his guitar and set his pencil aside when he was told to seek a young new entertainer by the name of Vince Gill to co-write a song with. Bill remained hesitant as he was not known to write with other people. Nonetheless, he called on Vince and the rest is written in Country Music history. Prior to this, Bill enjoyed an extraordinary career. One that took him from being a radio disc jockey to a successful entertainer. His love for Country Music has brought him to see his first live Grand Ole Opry performance at the Ryman Auditorium to joining the cast five years later; on July 15, 1961. Bill shares some of his experiences on the Opry in his book, including a great story about the first show ever performed at the new Opry House. "I wouldn't take anything for having done that." shares Anderson about running out into the audience to witness the first live show at the new Opry. "That is a vivid memory in my mind that I wouldn't take anything for having done that. Being out there and seeing it from that side. Seeing it as the fans saw it. It was a very emotional moment. I didn't know what they were going to do. I had no idea! I knew Mr. Acuff was going to open the show...But I had no idea that they were gonna show the film... then raise the screen up and he would be out there live. That was a very emotional thing for me. I'm just so thankful I got to do that, even though I had to run to get backstage..."
In Bill's new book, he shares many memories of events and special people whom he has worked with over the years. "It was fun to relive them...It was both thrilling and little bit emotionally draining, if that's the right way to say it." tells Bill. "Because, yeah...you know you sit there and go back through that and you say 'golly I lived through that once and you know here I am livin' through that again.' I did an audio book coming out on this in October...so I didn't just relive it once, I relived it twice! I sat there and read the audio book myself! You know some of the emotional parts, they get to you...emotionally draining. That's the best way to say it." 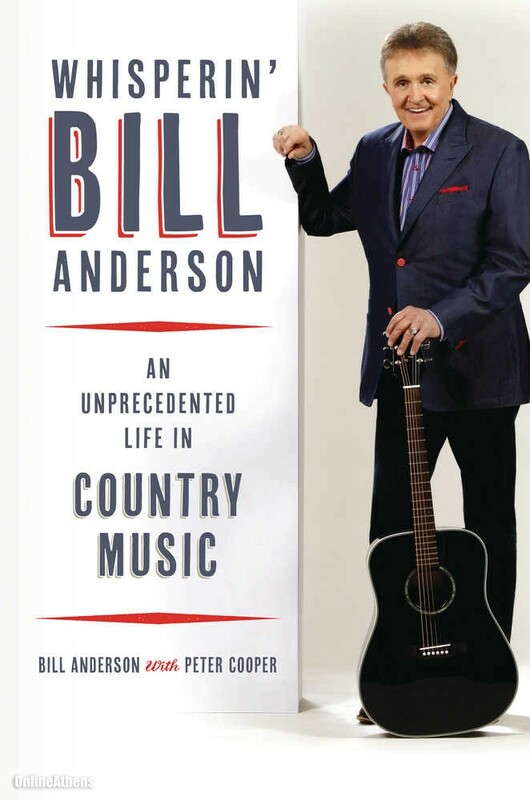 The most gracious part of Bill's book is that it has a delicate and entertaining flow as he tells his story, but also shares much of the history of Country Music as he lived through it. Majority of Anderson's career took place during an important part in Country Music history. With such a vast career, it must have been hard to choose what to include. "Peter Cooper shouldered a good bit of this burden for me...was picking out what to include and what to leave out. I mean I wanted to tell everything that I could, but my golly when you've done it for as long as I have and all...you can't just tell every single little thing. So, kinda choosing the parts to focus on, which songs to focus on, which relationships to focus on...this kind of thing. What parts and pieces do we include and what parts and pieces do we leave out? I had to go back and use some of the things from the first original book. I mean you can't rewrite history. You know I can't say I was born some where else! I was still born in Columbia, South Carolina, you know! You have to kind of go along with that..." laughs Bill. Through the course of his vast career, Bill has written thousands of songs. In his book, he shares many stories behind the more notable songs. However, two stand out amongst the others. "There are two that speak to me personally more then others. One from earlier in my career and one from later in my career." shares Bill. "The early career song would be 'Momma Sang A Song' of course. Because it's, you know, kind of the pages out of my life. The other one is 'A Lot of Things Different' that Kenny Chesney caught. I was in different places in my life and in my career when I wrote 'Mama Sang A Song' and then co-wrote 'A Lot of Things Different.' But I think those are the two that probably speak to me personally." Whisperin' Bill Anderson may be known for his gentle and soft vocals, but his career is anything but soft. His career consist of 40 studio albums, seven No. 1 singles, 29 Top 10 Singles and a six time Songwriter of The Year award winner. His songs have earned various ACMs and CMAs. He has been honored to have been a member of the Grand Ole Opry for more than 50 years and was inducted into the Country Music Hall of Fame in 2001. In 2015, Bill proudly accepted his first Spirit Award for President's Choice Award with his album Life. One year later he earned his second Spirit Award for Album of The Year with his album God Is Great God Is Good. Many of his songs have been nominated for the Spirit Award's Song of The Year. This year he has earned another nomination for his song "Everything Hank Williams Did, But Die" recorded by Moe Bandy. Today, he continues to appear on the Grand Ole Opry. He also continues to write songs as he recently wrote a song with Brad Paisley for Brad's new album. Bill just recorded a new album that will be released soon. The project features never before heard acoustic versions of his more notable songs. "It's just kinda been what I've been fortunate enough to do for a living." states Bill. "There's so many things in the world I can't do...I couldn't drive a nail straight into a board...I couldn't lay a brick...I couldn't tend an engine on a car. There's so many things that other people can do, that I can't do... I'm just glad I can figure out something I can do!" Long before I was writing or entertaining or trying to do anything, I was a fan! I was the biggest country music fan in the world. I have not lost that. Obviously I don't see everything through rose colored glasses and I realize everything in the business that glitters is not gold, it's realistic. But I am still at heart... I'm basically a fan!